I have always taken an interest in things. For example, of all the groups persecuted by Nazis, I knew the least about Gypsies. When I had the leisure, I went to the university library and read everything they had on the subject which was very little by the way. In a library with over 1,000,000 volumes they had maybe three or four poorly researched books. Crammed together in a research office with a not unattractive Jehovah's Witness woman, I took up with her for a brief time and researched everything about that religion. Finally, I worked in a restaurant that served wholesome food at a reasonable price. Comment cards were placed on the table as "table tents." People would fill these cards out and the comments were mostly beseeching us to place a franchise in their city. The imploring tone of these comments stuck in my mind and I wondered who were these people and what kind of impetus caused such a response. Later, I found out from an article in The International Restaurant News or some other trade slick that only about one percent filled out these surveys and this agreed with my experience, so I internalized it. AE9/11, like the example above is basically a survey. I don't know the "menu mix" of architects to engineers but one could "cipher it" easily to quote the preposterous Jethro Bodine. If at least half, which I suspect to be true, are architects then the survey response would mirror my restaurant experience as The National Council of Architectural Registration Boards (NCARB) indicates that there are currently 104,301 registered architects in the United States. This is not Chomsky's "miniscule" or "tiny" number. This is not to be construed as a scientific inquiry, as I stated, I have merely "poked around the topic" and there may be other governing bodies as well. According to a website called SurveyGizmo "Response rates can soar past 85% (about 43 responses for every 50 invitations sent) when the respondent population is motivated and the survey is well-executed. Response rates can also fall below 2% (about 1 response for every 50 invitations sent) when the respondent population is less-targeted, when contact information is unreliable, or where there is less incentive or little motivation to respond." Gizmo mentions incentives, as I highlighted, but they say nothing of disincentives. As we all know: "there's a man goin' 'round takin' names." Anonymity is not just to protect the corpus of your mother above you as you type away in the basement of her two bedroom brick rancher and we don't need Snowden to tell us about scrutiny and packet sniffing 'cause there's a man goin' 'round' takin' names and there is a big disincentive to going public on any controversy. We are living in a climate of fear which is the only reason for surveillance. And as for Chomsky's "easy breezy" publishing and making it appear that academia is so easy that a kid could do it: that is utter horse shite. Chomsky: Anyone who has any record of, any familiarity, with political activism knows that this is one of the safest things you can do. It’s almost riskless. People take risks far beyond this constantly, including scientists and engineers. I could, have run through, and can run through many examples. Maybe people will laugh at you but that’s about it. It’s almost a riskless position. I had the pleasure of studying under the foremost neurophysiologist in the world. And, please, let me take the opportunity to point out that just because you study under someone doesn't make you great. Not every peripatetic follower of Socrates becomes a Plato or an Aristotle. I mention this because I had one professor who was basking in the glory of the fact that he was only a couple of generations away from one of the principle researchers in 20th century psychology which was pure vanity and snobbery. There are many controversies in the field of psychology. Some psychologists feel, and can in some states, that they should be able to prescribe drugs citing that they "have seen it done before." I first was apprised of the former on a bulletin board in the psych clinic where I also saw a report that talking to people in therapy could cure brain lesions. This I had to see. I went around the campus imploring any of my professors to show me a photomicrograph of such a lesion or some kind of tomography. Then I went to the foremost neurophysiologist in the world and his response was: "I can't answer that question; I need a place to hang my hat." That is when I knew I was in a Freudian school, because no one would come out and say it. You couldn't say anything against "the talking cure." Nothing is as easy in academia as Chomsky states, and the truth is held hostage. Peter ORourke on Fri, 11/29/2013 - 9:33pm. How does this look from Chomsky's desk at M.I.T? Simple Truths on Mon, 12/02/2013 - 9:51am. No intellectual has let me down as much as Chomsky has when it comes to 9/11. Stubbornness is only human, and we all bear some of it; but one might have imagined that Chomsky would convey a broader perspective than he has. I would respect him much more if he admitted, "I don't have the answer, but 9/11 was a major turning point in US history and our international policies. Many people have been slaughtered as a consequence of our interpretation of 9/11. And so, it would behoove us and the world and our future to continue investigating this event until the answers inherent in it are rendered more clear. We need, without immediately condemning them, to cast an inquiring and skeptical vision over those who benefited politically and financially from it." But for Chomsky to stand in ignorance on what he considers the "safe" side of the argument, is, of course, cowardice. To Kevin: Thanks for trying. At least Chomsky admits it is conceivable that explosives were placed in the WTC. Hopefully he will admit more in the near future. It would be interesting to debate Chomsky publicly about 9/11. My guess is, he would continue pertinaciously a while... but that there might come a moment of realization where he would recognize his own skewed opinion and become more open to encouraging a more involved and widespread investigation of September 11, 2001. That may appear absurdly optimistic. It could happen, though, I think, if Chomsky were forced to debate in an evenhanded situation in which specific questions were presented to him, which he really had to deal with, rather than just shrug his shoulders and feel reinforced by the one-sided crowds to whom he generally speaks. Satyakaama on Sat, 11/30/2013 - 2:31am. ... I've always respected his intelligence and his capacity to call a spade a spade. But there's a logical fallacy, an embarrassing reliance on strawman argument, at the heart of his attitude to 9/11. It's puzzling. Perhaps his MIT colleague, prof Eduardo Kausel, fed him the 'The Chewing Gum" theory whenever they bumped elbows at the MIT water-cooler ? Chomsky could take a more balanced position. -- "As this issue seems to trouble so many good people, let's take the discussion to open and democratic public platforms, so that we can all be informed." -- "I am not keen to discuss the science, as I am a linguist.. But I am keen to discuss media, propaganda filters and the power of propaganda. So I will pay attention to how the media treats this subject.'. But he doesn't. He raises a clutch of strawmen. Why does Chomsky think that media like CNN, New York Times, London Telegraph, BBC and The Guardian have *never* run a *serious* interview with Kevin Ryan, Richard Gage, Graeme MacQueen, Steven Jones, David Griffin? What does he have to say about the media silence on this subject? What does he have to say about media actively smearing critique with pejoratives like 'conspiracy theory'? Given his own quote on conspiracy theory,, he understands the function of the put-down. Chomsky risks destroying his own legacy. 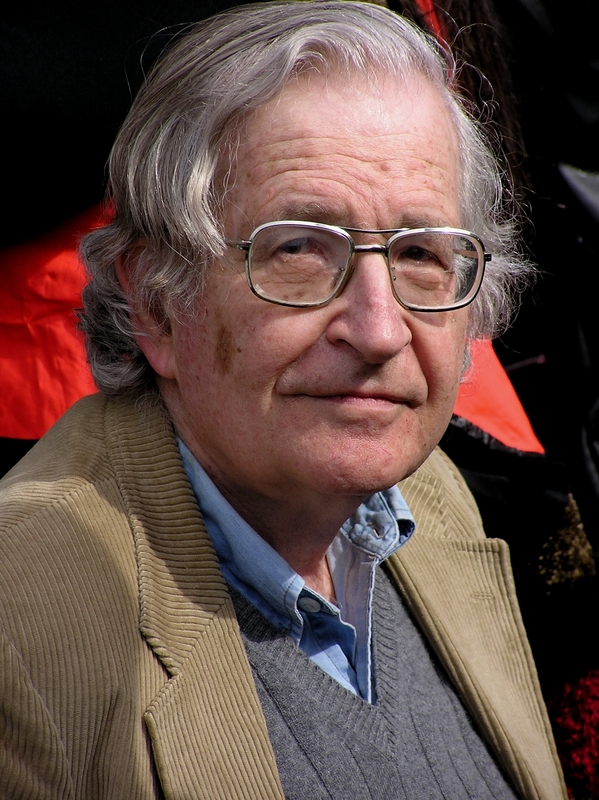 Once the truth of the 911 scam is widely known, Chomsky will be remembered as the intelligent figure who stymied the free flow of information, providing rationalisation for leading intellectuals to keep their heads in the sand. Who benefits from "heads in the sand"? Cui bono? "Chomsky says good activists don't look at *that* taboo subject, guys!" Whether his 'thought-stopper' attitude is witting or unwitting, the effect is the same. His comments come across as condescending and disrespectful to scores of decent human beings, even though he probably doesn't mean it that way. This attitude could discourage people from reading his books, which will be a pity as they are highly informative. Simple Truths on Sat, 11/30/2013 - 7:59am. I had an anthropology/linguistics class with him a long time ago and had trouble understanding his theory and his teaching method was fairly opaque. Fast forward to how he handles 9/11 truth, he's had practice chirping around 9/11 truth with the same side stepping and lingo he used in teaching. Why even bother pursuing him when he knows full well what the truth is but refuses to acknowledge it? marzi on Mon, 12/02/2013 - 7:54am. Pity Chomsky's treated people with disdain..
... because his condescending attitude is off-putting. This esteemed professor's denial of basic Newtonian physics amounts to complicity in war propaganda. Chomsky wags a patrician finger and tells *real activists* not to waste their time on that non-important event, three skyscraper implosions serving as a war trigger. Comes across as intellectual snobbery of the first order. Chomsky has no idea *who* the 911 activists are, what their history of activism is, what their interests are. He admits he hasn't even looked at their work, but dismisses them anyway. Simple Truths on Wed, 12/04/2013 - 11:30am. This is more what I would have expected to hear from a thinker who popularized the notion of Manufacturing Consent. ! jnelson on Fri, 12/13/2013 - 8:47pm. Joe on Sat, 11/30/2013 - 7:35am. Orangutan. on Sat, 11/30/2013 - 10:29am. Just watched the Huff Post of Chomsk video here's what I think. From a self proclaimed Anarchist that's one of the biggest appeals to authority I've witnessed!. "If a scientist makes a discovery they write about it in Proffessional Journals etc etc"
will certainly get you "laughed at"
"If Bush wanted an excuse to invade Iraq why not use 9-11?" Well Noam apart from the fact that a Bush had already invaded Iraq, that Iraq had suffered 10 years of sanctions, a no fly zone, i.e Iraq was already a work in progress everybody in the "free world" knew that Saddam was "evil" particularly for starting to trade his oil for Euros yes evil evil man. Apart from all that Noam the premise of your argument is deeply flawed that is 9-11 wasn't just intended as justification for the invasion of a single "Axis of Evil" country no it started "The War on Terror" a global unending war. 9-11 gives licence for action against any "AQ supporting" country and excuse for the curtailment civil liberties in the Imperial "Home Land". Obviously Chomsky knows what he's doing - why people applauded when the MC said no more 9-11 questions shows that there were obviously many frightened authoritarian followers in that audience. no_body on Sat, 11/30/2013 - 11:46am. "From a self proclaimed Anarchist that's one of the biggest appeals to authority I've witnessed!. "If a scientist makes a discovery they write about it in Proffessional Journals etc etc"
I mean what's to "discover"? Free fall is not disputed, and writing to some Journal stating you've "discovered" Newton's Laws will certainly get you "laughed at"
AConfederacyofDunces on Sat, 11/30/2013 - 12:42pm. Whatever way around, Noam Chomsky has failed at the gate of 911. His awful commentary reveals a thinking that disturbs the deep conscious. He puts the weight back onto ‘outsider’ individual researchers and their bitter discovery of this heinous criminal deception confirming mainstream dogma that ’911 conspiracy theorists’ exhibit the ‘crippled epistemology’ invented and defined by Cass Sunstein and Adrian Vermule in their Naziified ‘Conspiracy Theorist’ paper. identifies who he is and why he has not, or pretends to have not, read the literature. Thanks for nothing Noam Chomsky. remo on Sun, 12/01/2013 - 5:05pm. One value all progressives have is opposition to racism. Some white people are better at it than others. Most interfaith and progressive groups take the following WEAK stand on Islamaphobia. They say we should not hold all Muslims accountable for the actions of s few. This is an appeal only to people with such high minded sensibilities that they already assume racism is wrong. You are essentially throwing in the towel rather than confront chest thumping proponents of American exceptionalism. If these reactionaries were shown evidence that 9/11 was a false flag operation, some would be MUCH less likely to support dropping bombs on Muslim homes thousands of miles away. Disagreeing on analysis is fine, but refusing to dialog is not. So, am I being unfair when I say progressives take a racist position when they refuse to discuss the possibility that Muslims are not the 9/11 culprits? If you won't even discuss the issue, I'm still hesitant to accuse you of racism, but I would level an accusation of hypocrisy. I have a bachelors from MIT, where I was radicalized by Noam Chomsky, Lillian Robinson, Wayne O'Neill and others. I took Noam's political course , "Intellectuals and Social Change" twice and audited it twice , all within 5 years. Each semester was different. My favorite semester was on fascism. Noam will, of course, address us this weekend. Allow me to take a lesson from my favorite of all his quotes. It was from his first political book, American Power and the New Mandarins. It goes, "The responsibility of intellectuals is to speak the truth and expose lies." Since so many progressive leaders, including Noam, hold that discussion of the evidence of a false flag operation on 9/11 is a distraction, isn't that equivalent to "We don't mind looking the other way about SOME government lies." I do feel a little funny challenging Noam to address this issue. It's like, gee Noam, I'm not satisfied that you are at the intellectual peak of two fields, linguistics and US foreign policy criticism. Seems too demanding of me. But, the issues involved with 9/11 truth ARE part of criticizing US foreign policy, not to mention the intellectual corruption of the so-called free press in the US, hardly a field Noam ignores. One day in class, Noam made a comment where I thought he was suggesting I was "obstreperous" . I didn't know what it meant, so I looked it up. it means," hard to control." A few years later I remember Noam being quite pleased that three different national level foreign ministers had publicly criticized him in one week. I don't think most foreign ministers trouble themselves to publicly attack college professors. I venture to say all those in attendance are glad Noam has been "hard to control." I used to actually feel badly that I never seemed to be able to figure out any hard questions to ask Noam. The Spartacists always did such a terrible job. They were stupidly hostile. I'm not, I just think Noam is remiss on the issue of the value of 9/11 truth to the antiwar movement as a whole. One mistake Noam doesn't make that many progressive do make is using the term "conspiracy theorist " as a put down. The proper way to make this point is to take issue with "conspiratorial thinking" . To suggest the term "conspiracy theorist" should be used as a way of criticizing someone is to imply that those in power are unlikely to abuse their power, a clear absurdity. Here is the question will ask Noam if I am allowed to during Q & A. It comes after my notice of Noam's recent exchange with Abby Martin on You Tube. Search you tube for "Abby Martin Media propaganda, war on terror, civil liberties, and more with Dr Noam Chomsky"
Abby Martin," ...in the aftermath of 9/11 when the Taliban said we will give you bin Laden if you present us with evidence, which we didn't do." Noam Chomsky," I know their proposal was a little vague, but we should have pursued it.."
The 9/11 truth movement includes progressives, libertarians, and people so new to activism they don't self identify ideologically. It is very much antifascist and leftists are antifascist. Why exclude 9/11 truth activists as allies opposing war and fascism when the left runs the gamut from democratic socialists to trotskyists? At times we explain to each other why we disagree, but we still coexist in various coalitions. The 9/11 truth movement drives me crazy with certain cultural aspects I'd be happy to discuss, but its goals are antifascist and that should be sufficient for leftists and truth activists to function as allies. Frankly, the truth movement could use some mentoring from the left about the value of activism, if I do say so. Noam is so busy, maybe some of the rest of you will reach out and dialog with me. Mark my words, "The suppression of 9/11 truth will be to the new left as socialist realism was to the old left. " All ideological people need be wary of becoming doctrinaire. It is intrisic to having analyses. David Slesinger on Sun, 12/01/2013 - 11:16am. Douglas Hilton on Fri, 12/13/2013 - 8:27am.